Hurry! 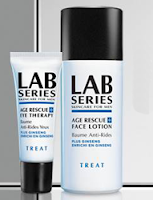 Right now you can a FREE Lab Series Age Rescue + Face Lotion & Eye Therapy Sample! Just "like" Lab Series on Facebook and fill out the form at the bottom of the page. * Face Lotion 2 ml sample, Eye Therapy 1.5 ml sample; one day supply. Limit one per customer.